To start with, there’s no perfect size for a banquet hall. No single rule of thumb applies to all. It really depends on various elements, such as the nature and size of your event, the number of guests you have invited, is it a strict invitation-only event or open to all, is your event big or small? Is it formal or informal? Do you want to achieve a bang or are you going for a more subdued effect? If your event is formal and includes a huge guest list, you should go for a bigger event space or banquet hall. However, if you’re having a casual catch up with your friends for dinner and drinks, maybe for a birthday party or just a get-together, and want privacy in your own space without being seated in an actual restaurant, it is best to go for a smaller event space. An important tip is to always check your guest list as well. A bigger occasion above 20 people would indeed require larger space, you wouldn’t want to end up having an event where there were more people invited and the place couldn’t accommodate, not only would they feel uncomfortable, but it would be embarrassing for you as well. Secondly, we also have to consider the nature of the event that: is it a dinner party to celebrate a product lunch or an Iftar or Eid Al Fitr reception. When you’ve invited for a dinner, you would need more space to accommodate the banquet tables. In addition, if this event is a corporate workshop or a training event that requires your attendees and participants to move around, then it’s best to have a banquet hall that’s bigger and allows people to move around easily rather than bumping into each other. 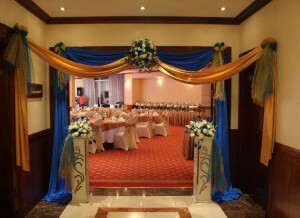 Your perfect banquet hall or event space is the one which rightly accommodates the number of guests you have invited. If you book a small event space for a large group of people, it would be crammed. On top of that, imagine if the A/C has a technical issue and people start sweating. People would start complaining and eventually would leave prior to what they had planned. This will only create extra and unnecessary embarrassment and may even lead the event to be a failure. On the other hand, just because it’s better not to get crowded that does not mean ‘Big Banquet Halls are Better’. This formula would falter here as well because if there aren’t enough guests and the area has too many empty spaces, they might be perceived as a poor turnout since people often have the assumption that guests are missing, and others might leave thinking the event was a flop since it was empty. Active listening comes with active auditory abilities. Imagine you were in a large hall and you weren’t able to hear the person giving the training session. This would result in people sitting in the back losing focus on the content of the training delivery. They would resort to speaking amongst themselves. The last thing a presenter or a training instructor would want to do is to single out people in the back to “pay attention”. Communication is key in all such events. A big banquet hall comes with its high costs. If you don’t have a heavy list of guests, it is wise to choose an appropriately sized event space or banquet hall. All in all, don’t go for too big or too small just go for the right size for the perfect event! Make sure you take a good look at the space size and align that with the objectives of your event.